What do we usually do in half-terms? Yes of course, play football. It's with SSA, who he plays for, and at £10 a day from 10-3, it's very good value. Add a packed lunch too to save more money. 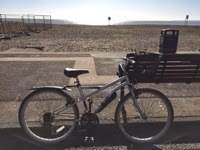 For my money saving effort, but mostly purposeful exercise, we cycled up to Goals and then I rode back into Southsea along the sea front, pausing for a quick gaze at the sea, feeling the heat through my black jeans, before meeting my old friend for lunch in Capers. Time went on, we nattered, I bought lunch, she left to start work. I cycled back the same way to pick Ben up. At home, we spent the rest of the afternoon eating pancakes and drawing Skylanders! HEALTH AND FITNESS I cycled well over 10 miles today, which is unbelievable really, if I hadn't seen it on Map My Run. TODAY'S HIGHLIGHT Nattering with my friend, whom I hadn't seen for a year.